There is an archive at the Graveyard. Pronup Sims is an old site, true, and hasn't been updated in a couple of years, also true, but it is one of those sites I am so happy still exists for me to pillage downloads. If there were any long gone creator I wish would come back, it is the creator of Pronup Sims. 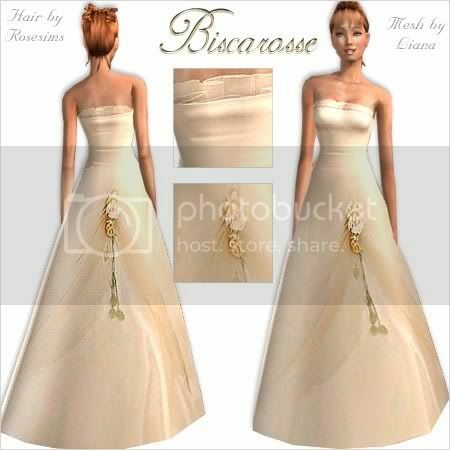 She has the most beautiful clothing and accessories for that special sims wedding you've always dreamed of. Clothing: Bridal gowns, Grooms tuxes, Outfits for the wedding party and guests. Make-up: Looks for the special day. Hair: Hair styles for the bride. Accessories: Tiaras, Veils, Scepters, Flowers and more!